It is never prudent to completely dismiss the suggestion that the purpose of your life to serve as a warning to others. It may not be a leading hypothesis, but it is a possible one. That being said, this essay contains John J. Reilly’s reflections on how Christians ought to relate to politics. This essay is brief, but only because John included most of his thought by reference, rather than repeating things he had already said. Like all of us, John had particular political commitments and preferences, but I think he pointed toward something bigger than his party affiliation here. I do find it peculiar that there are so many people who make national politics a central part, if not the central point, of their theology. And I'm saying this as a member of the Christian right by blood; when Ralph Reed was in town with the Christian Coalition, he stayed at my parent's house. There is, I suspect, an unconscious stream of omniderigence underlying the concept of divine American exceptionalism. Either God has inordinately blessed America because of the unique qualities of her inhabitants or because He has a special plan for America. The problem with the first possibility should be obvious in light of the character and behavior of said inhabitants; the problem with the latter is that it requires believing that the Christian God is responsible for the death of millions of unborn children, the establishment of transnational globalism and Paris Hilton. Wise words (particularly "omniderigence"). One might point out that the United States could have been providentially preordained as an Awful Example, but I rather doubt that to be the case. The first is the status of politics and government in a Christian framework. I don't really find this problematical: all government is a divine institution, in the sense that legitimate authority comes from above. That by no means implies that all governments are or should be theocracies. However, there is a sacred, not merely prudential, obligation to participate in public life and not make a nuisance of yourself. Patriotism is a virtue. Get over it. On the other hand, patriotism is not analytically the expression of the highest political loyalty. (In many eras in may be the highest available, of course). The common humanity of the human race implies natural standards of just treatment, which, as the human race interacts on a broader and broader scale, implies the establishment of ever more universal structures to ensure these standards. Dante famously argued that only a universal government could be altogether legitimate. The Catholic Church, after having skewered Dante (posthumously) for his inordinate affection for the Holy Roman Empire, has come around to an oddly similar point of view, in the sense that doctrine today asserts that certain sovereign prerogatives must, in the modern world, be reserved to supranational authorities. This presents us with the second issue: the relationship between theodicy and macrohistory. If you accept that there is a tendency toward global unity, does that make the process a divine imperative? Contrariwise, is there an imperative to oppose it? (As C.S. Lewis once remarked, just because you have terminal cancer is no reason to be on the tumor's side.) For my part, I would suggest that this question tends to generate much the sort of category mistake that we see in sacralized environmentalism: anything as big as history or the atmosphere is presumed to be a theater of miracle and moral absolute. Nonetheless, there is an level of loyalty that is ordinate to the ideal universal empire that Dante envisioned. For St. Augustine in the final generation of the Roman Empire, this loyalty was the highest form of patriotism he knew. Similarly, it would be possible to make the argument that some form of globalization merits devotion of this order, since the universal empire is also a divine institution, though most of the time it exists only virtually. If you accept the neo-Spenglerian hypothesis that the United States is going to play the same role in the modern world that Rome did in Classical antiquity and Qin did in ancient China, then you might be able to formulate "God's Plan for America" in terms of the providential formation of a universal state at the end of the modern era; however, this development would be "providential" only at the level of natural providence, not as a matter of divine election. In other words, somebody had to do it. Transnationalism has a stratosphere, a troposphere, a sea level, and even an ocean floor. Islamist transnationalism flows through those murky depths, to which it is specially adapted. In part for that reason, it is not so much incompetent as incapable. The things it can do, such as blowing up airplanes and running neighborhood medical clinics, it can do very well. What it can't do, no more than a shark can tap dance, is provide decent civil administration for a territory, or even a legal environment predictable enough for a market economy to operate above the level of small shops. The acme of its political role is to refrain from destroying the state structures of societies that serve as its hosts. Even then, it's a debilitating parasite. Thus, simply by nature of what it is, Islamism cannot "win," in the sense of destroying and replacing an adversary, or forcing a defeated opponent to do its will. It has no organ with which to receive a surrender. Deprived of the pressure of an external enemy, it bursts into factional fighting. As an assessment of ISIS, this is spot on, ten years before it even existed. The ability to predict what will happen is the only yardstick that should matter in things like this. Why did spelling reform miscarry in the early 20th century? If we may believe these videos. it was because the movement was supported by prominent persons such as Theodore Roosevelt and Andrew Carnegie. Roosevelt politicized the issue with his order to the Government Printing Office, and Carnegie was suspected of plotting to make a fortune in textbook publishing once a reform was underway. If the Gates Foundation offered us at the American Literacy Council a large grant, I might argue to turn it down. Unless the money could be delivered in brown paper-bags, of course. Incidentally, I am working on reprints of various public-domain texts using Soundspel, the teaching orthography that the ALC software uses. Here is the cover art for the first experiment. More details soon. Even without a documented connection to a notable forebear, experts say, the odds are virtually 100 percent that every person on Earth is descended from one royal personage or another...It works the other way, too. Anybody who had children more than a few hundred years ago is likely to have millions of descendants today, quite a few of them famous. Everyone of Western European extraction is about equally related to Charlemagne. Maybe everyone, everywhere, is somehow related to Mohammed and Gengis Khan. At the eschaton, of course, we will all be famous or infamous. Lebanon is a sovereign state. It has an executive and a military. But its military has less sophisticated weaponry than Hezbollah and its executive wields less authority over its jurisdiction than Hezbollah. In the old days, the Lebanese government would have fallen and Hezbollah would have formally supplanted the state. But non-state actors like the Hezbollah crowd and al-Qaida have no interest in graduating to statehood. They've got bigger fish to fry. If you're interested in establishing a global caliphate, getting a U.N. seat and an Olympic team only gets in the way. ...And that indifference to the state can be contagious. ...What if entire populations are being transformed into "non-state actors"? Not terrorists, by any means, but at the very minimum entirely indifferent to the state of which they're nominally citizens....Hence that statistic: Seven percent of British Muslims consider their primary identity to be British, 81 percent consider it to be Muslim....Modern multicultural man disdains to be bound by the nation state, too; he prides himself on being un citoyen du monde. The difference is that, for Western do-gooders, it's mostly a pose:...Absent a determination to throttle the ideology, we're about to witness the unraveling of the world. I take his point, but I question whether the de-nationalization of the world's transnationalists is just a mere pose. I am echoing Patrick Kennon in this regard. Certainly it is the case that the Davos People don't want to live under a universal caliphate, or even to stay at the sort of hotels that cater to people who might have inclinations along those lines. Was President Bush correct yesterday when he characterized the cease fire in Lebanon as a victory for Israel, or possibly in the war against terror? Perhaps he was right in the sense that Hezbollah's Lebanese hosts will no longer willingly acquiesce in actions by Hezbollah that threaten to bring Israeli retaliation. On the other hand, tactically, the war turned out to be a fair fight. The prospect of another fair fight makes the threat of retaliation less credible. What does Tradition have to say about Israel? Very little good, to judge from Voxnr a French-language site where Yockey and Evola make merry with Islamists and Eurasianists. Actually, one of the more moderate pieces, in that it does not advocate the immediate extermination of Israel and everyone in it, comes from Alexander Dugin (aka Alexandre Dougine). In the brief essay Palestine et Tradition, notre solution, Dugin praises President Putin for reasserting Russia's historical interest in the Levant (remember the Russian proposal for an immediate cease fire?). He also characterizes Israel as laicist and fundamentally illegitimate. Nonetheless, he also notes that, under the Traditional divine monarchy of the Ottoman Empire, the three confessional millets of Christian, Jew, and Muslim were able to live in Palestine without too much friction. He notes with approval the growing theological dimension among the Muslim enemies of Israel, but also remarks with hope on the increasingly Orthodox nature of Israel. Surely peace would come if Palestine were reconstituted as a Traditional land. Is it over-extrapolating to say that Dugin is implying that what Palestine really needs is to become a Russian protectorate? A common claim of the origin of the Dunmow Flitch dates back to 1104 and the Augustinian Priory of Little Dunmow, founded by Lady Juga Baynard. Lord of the Manor, Reginald Fitzwalter and his wife dressed themselves as humble folk and begged blessing of the Prior a year and a day after marriage. The Prior, impressed by their devotion bestowed upon them a Flitch of Bacon. Upon revealing his true identity, Fitzwalter gave his land to the Priory on the condition a Flitch should be awarded to any couple who could claim they were similarly devoted. The priory that once conducted the Flitch trials has long since lapsed, and so has the interest of the local aristocrats who conducted the trials thereafter. The trials are still held, however, with volunteer married couples trying to prove to a jury their faithfulness; opposing counsel represents the owner of the flitch. This Flitch business immediately reminded me of the 1973 film, The Wicker Man, about a policeman who investigates a Scottish island where human sacrifice is a beloved local custom. It's an odd film, essentially a horror story with no gore, and indeed little direct depiction of the supernatural. A remake starring Nicholas Cage will soon be playing in a theatre near you. The story has been relocated to the coast of Maine. My blood runs cold already. What a world with Open Borders looks like. Oh wait, this is the part without them. In 2006, John correctly noted that Open Borders was starting to become a defining feature of the ideology of the governing classes throughout the West. He also correctly noted that few people in the electorates at the time noticed just how extreme many politicians and career bureaucrats had become on this subject. Twelve years later, this has all come out in the open. The consequence of this has not been moderation or compromise, but rather the elites have doubled down on the idea that immigration can't possibly be a bad thing, and in reaction, anti-immigration parties are on the rise in Europe and elsewhere. The short answer to the open-borders argument is this: it would be better if the economy shrank than that America should be abolished. The open-borders thesis is false, of course: there was healthy economic growth in the 1920s, and in the 1950s and 1960s, when immigration was negligible. During those periods, the large immigrant influx of the late 19th and early 20th centuries settled in very comfortably. I know this because I'm related to them. That was a happy outcome, and we should do it again. The alternative is that the United States more and more resemble the Persian Gulf states, where most manual labor is done by a permanently inassimilable caste of aliens. Does anyone really want to live in a country like that? Neill Blomkamp's Elysium came out after John Reilly had died, but I thought it a rather biting satire on the kind of world open borders would be likely to produce, wrapped in a sci-fi story that was purportedly about universal healthcare. Who find this likely, and who not, is likely to define sides in the years to come. A conference geared to help Democrats infuse God into their politics begins tomorrow at All Souls Unitarian Church in the District [of Columbia] with the unveiling of a "spiritual covenant with America."... The "Spiritual Activism Conference" aims to equip liberals to operate in a political arena where religion has played a more prominent role since 2000, says Rabbi Michael Lerner, founder of the Jewish magazine Tikkun and a chief conference organizer. ...an alternative to former House Speaker Newt Gingrich's successful 1994 "Contract With America"...a new term, "spiritual progressives" for the religious left. ...Part of the conference's intent is to form "spiritual caucuses" inside all political parties by the 2008 elections. These caucuses would work to bring elements of the "covenant" onto party platforms. Lerner has a new book out, The Left Hand of God, which explains this initiative, but we should remember that he has been promoting these views for a long time, as readers can see from my review of The Politics of Meaning, which Lerner published ten years ago. A more recent entry to this field is David Callahan of The Demos Institute, who also has a new book coming out, The Moral Center. Spiritual progressivism is a singularly futile enterprise. There is no market for it as a spirituality, and as politics even naive people quickly see that it's just Saul Alinsky for seminarians. (How do you recognize this type of activist? They talk very fast, and they always characterize their opponents as criminals.) Some of its proponents have managed to insert themselves into the rolodexes of journalists, so we will be hearing more from them next year and especially in 2008. Nonetheless, they are the incumbents of a Potemkin Cathedral. You are convinced of certain fundamental things. The current immigration system is completely unsuited to a global market economy. We need to move out of the era of failed prohibition into the era of flexible control. To use the term coined by Brooks's colleague, Thomas Friedman, this is globaloney. The same issues attend immigration today as attended it in 1900: public order, national identity, and economic growth. (The years around 1900 were arguably part of an earlier episode of globalization, but that episode ended with the First World War: the lesson is that globalization is intermittent.). The situation has changed since then only in that technology has in principle made the border more controllable. Here is the sort of intemperate statement that cyberspace facilitates: Every candidate for federal office should be asked if it is possible to gain physical control of the southern border. Any candidate who says "no" should not be elected. In fact, any current officeholder who says "no" to that question should resign and be replaced by someone who believes the United States is defensible. You see that I am using more italics? That is a sure sign of growing fanaticism. You know a movie's a dud when even its self-flagellating albino killer monk isn't any fun. I'm sure I'll see the movie eventually. Both those who have and those who haven't seen it, but are interested in the subjects with which the film deals, might want to consider settling down for an hour and 40 minutes to see The Real Da Vinci Code, an excellent documentary hosted by Tony Robinson that aired on Wildfire Television last year. He makes the very interesting point that the mythology of the Priory of Sion on which The Code is premised was a self-conscious exercise in Surrealist performance art. My only quibble is that Robinson's skepticism is suspended for the few minutes in which Elaine Pagels speaks. Her theories about suppressed feminist Gnosticism are not a hint that there might be something to the thesis of The Code after all; her theories were one of the key ingredients in Dan Brown's literary confection on which the film is based. The Gnostics were self-conscious surrealists too, I think. Pagels has never grasped that she is attributing fundamental significance to texts that were not supposed to be taken with a straight face. If that is the case, then maybe the Opus Dei also saw to it that vast, unnecessary sums were amassed to make this film from investors who were sold more than 100% of the potential profit. The producers would keep the investment capital if the film failed; they would be ruined if it succeeded. Now that would have been a good idea for a movie. John Reilly here puts his unique gloss on President George W. Bush's second inaugural address. A lot of sober commentators at the time were surprised by its tone, which was utopian and revolutionary. John wasn't, because W was articulating something that has a long history in the West. In the early twenty-first century, the Republicans were supposed to be the boring party, which may be why so many people were surprised, but grand visions aren't limited to the American Left. Subsequent events did not pan out quite as expected, but I do agree with John that this kind of urge toward a universal state will keep trying to reoccur until something actually comes of it. By our efforts, we have lit a fire as well - a fire in the minds of men. It warms those who feel its power, it burns those who fight its progress, and one day this untamed fire of freedom will reach the darkest corners of our world. The industrial revolution was permitting men to leash fire to machines -- and to unleash power in each other -- with a force undreamed in earlier ages. In the midst of those fires appeared the more elusive flame that Dostoevsky described in the most searching work of fiction ever written about revolutionary movement: The Possessed. He depicted a stagnant (tranquil?) provincial town that was suddenly inspired (infected?) by new ideas. Shortly after a turbulent literary evening, a mysterious fire broke out; and a local official shouted out into the nocturnal confusion: "The fire is in the minds of men, not in the roofs of buildings." The connotations of the phrase are ambiguous at best, though better than those of the title of Adam Zamoyski's more recent treatment of the subject, Holy Madness. A quick sounding of the Web this morning revealed that the derivation of the term had also been noted by Antiwar, NRO, and a few other commentators. What we have here is no longer a reaction to events, but a determination to create them. The inaugural address itself was startling. It left me with a bad feeling, and reluctant dislike. Rhetorically, it veered from high-class boilerplate to strong and simple sentences, but it was not pedestrian. George W. Bush's second inaugural will no doubt prove historic because it carried a punch, asserting an agenda so sweeping that an observer quipped that by the end he would not have been surprised if the president had announced we were going to colonize Mars. Renewed in our strength - tested, but not weary - we are ready for the greatest achievements in the history of freedom. This is--how else to put it?--over the top. It is the kind of sentence that makes you wonder if this White House did not, in the preparation period, have a case of what I have called in the past "mission inebriation." A sense that there are few legitimate boundaries to the desires born in the goodness of their good hearts. One wonders if they shouldn't ease up, calm down, breathe deep, get more securely grounded. The most moving speeches summon us to the cause of what is actually possible. Perfection in the life of man on earth is not. Let me suggest that perfection does not have a nickel's worth to do with it, except perhaps in Spengler's sense. The president was articulating something very close to Walter Russell Mead's model of America as the engine of perpetual revolution. Far more interesting than that, however, was the speech's attempt to satisfy what William Ernest Hocking defined fifty years ago as the essential predicate for a world civilization: a common transcendent basis. If Peggy Noonan was put off by the speech, then it was inadequate. Any attempt at a formulation would be inadequate now, and for many years to come. Still, the president's approach has more of a future than does secular transnationalism. In the years since this was written, the shifting of politics from a left/right axis to a globalist/nationalist axis has continued. In the last paragraph, John noted that the attempt of the US to continue to function as a sovereign nation in the Great Power/Treaty of Westphalia sense probably wouldn't work, since only the US was capable of really doing that at the time. In the years since, I think we have seen an increasing attempt by other nations to do just that. Most of these players are still the "Great Powers" of the twentieth century, the parties to the Second World War. In the immediate aftermath of 9/11, it was common on the American Right to make fun of the French, but then as now the French continue to project power into it's former colonies and current overseas departments. The United Kingdom does the same. I see that the candidates for the American presidency are still up to their tomfoolery. I will, of course, make further remarks on the matter in the future, but the fact is that the Kerry Campaign is impervious to good luck. Is there really much more to say? Defined for so long as the arbiter and guardian of progressive art, [New York's Museum of Modern Art, a.k.a. "MOMA"] reopens on Nov. 20 -- its 75th birthday -- at a time when even its own curators no longer believe that art progresses like science. This insight is not new. However, the institutions that have supported modern art for a century were designed with a teleological view of cultural history. [Alfred H. Barr Jr. was MOMA's director at its founding in 1929.] The who is credited or vilified as the Great Codifier is Barr's successor at managing the collection, William Rubin. Unlike Barr, Rubin -- who was chief curator of P&S for 20 years -- had few scruples about sidelining work that he deemed minor. Along with many art scholars of the time, he had been heavily influenced by the critic Clement Greenberg, a lapsed Marxist who transposed his old political faith (in the inexorable evolution of capitalist society toward socialism) into a formalist canon marked by a similarly inevitable progress (from the Post-Impressionism of Cézanne to the Cubism of Braque and Picasso and onward to the Abstract Expressionism of Pollock, Barnett Newman and Clyfford Still). Although Barr also had an evolutionary way of thinking, he conscientiously kept his mind open. Because he was operating at a time when modernism was still fresh, that was easier to do. Under Rubin, the creed became dogma. Cerebral and increasingly abstract art was the mainstream, and the subordinate currents, if shown, were to be displayed off to the side. The concept of modernism is famously difficult to define. Unquestionably, though, one of the basic tenets of modernist art is a subordination of the putative subject matter (the person in a portrait or the mountain in a landscape) to the peculiarities of the medium (the application of paint to a flat canvas or the relationship between a sculpture and its pedestal). For MOMA to present its modernist masterpieces thematically was as shocking to some as it would be if the Catholic Church were to classify its relics by blood type. Perhaps I have read The Glass Bead Game too many times, but I wonder that anyone should find this turn of events surprising. The interesting question is whether anything like the 20th-century art industry will long survive in the 21st. No doubt fashion objects will continue to be produced. They will not command anything like the residual religious deference that art commanded early in the modern era. Along with art, the international system is continuing its transition from modernity, as we see in John O'Sullivan's piece in The New Criterion of October 2004, Gulliver's travails: The U.S. in the post-Cold-War world. Kenneth Minogue calls this structure of governance "Acronymia" after the UNOs and NGOs that constitute it. He credits the present author with giving the name "Olympians," after the gods of Antiquity, to those who administer it. Ancient gods used to "kill us for their sport," but modern Olympians are content to regulate and preach at us. John Fonte has defined the common ideology they preach as "transnational progressivism": national sovereignty and the nation-state are disappearing in favor of a new structure of international organizations and rules that goes by the slippery name of "global governance." Here was where the Tranzis began to make a comeback from their slide into irrelevance after September 11. The rest of the world wanted to see the sole remaining superpower subject to some other authority when it intervened elsewhere. As a practical matter the United States was unable to confer legitimacy upon its own actions. But the Tranzis are partly in the business of conferring it on international actions from their various legal, charitable, and political perches in Acronymia. If, however, a giant inhabitant of Brobdingnag were to come to [the Lilliputians'] assistance, Gulliver would be defeated. Can the Tranzis hope for similar assistance?...If the United States is to defeat the terrorists in war or the Tranzis in international politics, it will have to take on the E.U. first. It is likely that this clash will occur most substantially over the war on terror. If, however, Mr. [Mark] Steyn is right in his pessimism -- and that's the way to bet -- then the United States will face a difficult future as a military superpower continually frustrated in middling matters by the resistance of international bodies. Europe and America will divide into two separate civilizations -- the Anglosphere (minus England, plus India) and the Holy Secular Empire -- uncomfortably housing a growing Muslim minority. Even in America, liberal democracy will be gradually transformed into a politically correct judicial oligarchy on Tranzi lines. But there is another possibility rooted in the fact that the first reactions of most people to a violent but distant revolution are generally appeasing -- vide the reactions of almost everyone except Burke and Churchill to the French and Nazi revolutions respectively. Only when it becomes clear that the terrorists’ aims are limitless and that nobody is safe does opinion turn harsher and more realistic. I can only repeat that what has been going on since the end of the Cold War is the search for the focus of legitimacy within the international system. The US insistence on sovereignty in its 19th-century Great Power form is not going to work, since the US is the only power in the world capable of functioning in that fashion. On the other hand, Acronymia unites hypocrisy with incompetence most wonderfully. The synthesis of this dialectic, when it occurs, is going to have to combine legitimacy with capability. Like Foucault, Upton notes that evolution in modern thought replaced ontological hierarchy with historical development. In fact, the fallacy that makes all the other New Age fallacies possible is the belief that new Truth (that, is truth not already contained by Tradition) can come to light in history. Upton's critique in this regard is not so different from other criticisms of "Process Theology," which might be summarized by the principle that God is the best that exists at any given time, not the best that can be. Reminds me of this current controversy in the Catholic Church. These ideas haven't gone away, or even changed very much. Globalization, the New Age Movement, and postmodernism did not merely arise at about the same time, according to The System of Antichrist. Rather, they are all manifestations of a common impulse, one that is not entirely of human origin. They are in fact symptoms of the impending end of the world. As is the way with eschatological analysis, much of the book's argument is best taken metaphorically. However, these are the sort of metaphors you neglect at your peril. The author, Charles Upton, began life as a conventional Catholic. He experienced the 1960's Counter Culture and subsequent New Age spiritualities, which he now views as pathologies that have been marketed to a mass audience. Eventually, he washed up on the shores of Tradition, and became a Muslim Sufi. Upton's book is largely a synthesis of the theological metaphysics of Frithjof Schuon's The Transcendent Unity of Religions with the eschatology of Rene Guenon's The Reign of Quantity and the Signs of the Times. The System of Antichrist does not attempt to summarize Tradition systematically, so neither will this review. Suffice it to say that Tradition is a curious blend of neoplatonism and comparative religion that was devised in the late 19th century and the first half of the 20th. Tradition, or corruptions of it, crops up in the most extraordinary places, from Black Metal music to the writings of Robertson Davies. As a matter of intellectual history, it belongs in the same class as Madame Blavatsky's Theosophy, Jung's psychology, and the comparative mythology of Mircea Eliade and Joseph Campbell. Additionally, I think it important to point out that Tradition is also closely related to the reaction against speculative philosophy that we see in Heidegger, with the vital difference that Traditionalists find that the Transcendent, rather than Being, is inescapably "thrown" to them. As we will see, Traditionalists tend to believe that the state of the world is very unsatisfactory, and fated to get worse. Wicked Traditionalists not only believe that the world is ending, but are keen to help it along. (One of the most puzzling features of this book is the failure to engage directly the esoteric fascism of Julius Evola.) In the sense in which Upton uses the term, however, "Tradition" means almost the opposite of world-hating Gnosticism. Gnostics deny the value of the world; Traditionalists see eternal value in the world. For Tradition, the creation of the world was not a mistake, but an act of divine mercy. Everything in it tells us something about God. These things include the human institutions ordained by God, the most important of which are the world's revealed religions. This is where Tradition differs from ordinary syncretism. Tradition is a spiritual practice that needs a revealed matrix. Traditionalists can be Muslims, or Jews, or Christians, or Buddhists, or even shamanists, but they cannot mix and match. These traditional religions, at least according to the Traditionalists, are united by the transcendent object toward which they look. Each represents a revelation of the divine nature; the differences between them can be resolved only eschatologically. The attempt to create a world spirituality, in fact, is one of the satanic counterfeits of these latter days. Although The System of Antichrist has its biases, it is not religiously partisan. Many of its theological points are perfectly orthodox. For one thing, Upton never departs from the principle that eschatology is fundamentally personal. Creation and apocalypse are always present. Eschatological history is only a symbol of the death of the ego and its replacement by God. In one sense, you are the Antichrist, and in your own latter day that tyrant will be overthrown. On the other hand, there is no denying that eschatology also has a universal dimension. The book usually works on the assumption that a personal Antichrist will appear in the penultimate stage of world history; several of the world's religious traditions say as much, and personification facilitates the discussion. 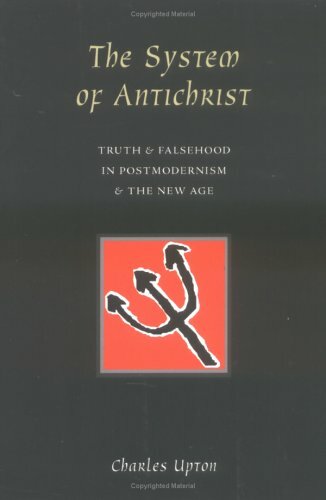 However, Upton reminds us repeatedly that the concept of Antichrist can also be taken to refer to a collectivity, one that has existed as long as Christianity itself. That collectivity becomes coherent and visible as the end nears. "[A]s this cycle of manifestation draws to a close, the cosmic environment first solidifies – this being the result and the cause of modern materialism – after which it simply fractures, because a materialist reality absolutely cut off from the subtle planes is metaphysically impossible. These cracks in the 'great wall' separating the physical universe from the subtle or etheric plane initially open in a 'downward' direction, toward the 'infra-psychic' or demonic realm (cf. Rev. 9:1-3); 'magical realism' replaces 'ordinary life.' It is only at the final moment that a great crack appears in the 'upward' direction..."
If you don't like esoteric metaphysics, this would still be an interesting statement about the history of philosophy. The rejection of the transcendent resulted in materialism, which, like all monisms, is at best incomplete. By the middle of the 20th century the materialist edifice was riven by skepticism toward scientific and historical knowledge. With the coming of postmodernism, very strange substitutes for metaphysics began to appear. Upton means much more than this, but this is one way to look at it. The Intellect is the faculty of the mind by which we perceive "self-evident truths." During the 19th century, the Intellect could no longer look to a transcendent God; even metaphysical first principles were rejected after Kant. In consequence, emotion became divorced from the truth. The affective part of human nature was expressed, for a while, as the irrational sentiments of Romanticism. The postmodern declension from Romanticism is emotional numbness, enlivened by atrocity and sinister fascination. There is such a thing as emotional intelligence, and the trajectory of the postmodern world is to stultify it. Postmodernism removes the possibility of romantic heterosexual love as a spiritual exercise. Worse yet, it makes God inaccessible. The New Age might be called "folk postmodernism," except that folk religion is better structured. In traditional civilizations, there is a hierarchy of the religious life: popular practice, an institutional church, and esoteric tradition. The New Age collapses these layers, so that the transcendent element that had been the object of esoteric spirituality is lost. All that remains is the psychic, meaning both ordinary psychology and the shadowy realm that surrounds the material world but is not necessarily superior to it. The result is people who channel extraterrestrials, or embrace psychological management techniques, or are attracted to some of the less-grounded forms of Pentecostalism. The forgetting of the distinction between psyche and spirit makes Antichrist's counterfeit of the spiritual possible. "It is certainly true, according to esoteric philosophy, that the created order returns to its Divine Source through the conscious spiritual unfolding of individual sentient beings. But this 'evolution,' this unfolding of the individual through a transcendence of the self-identified ego, is not a continuance of the cosmogonic process, but a reversal of the process..."
One could expand at length on the misapprehensions in this book about evolution. The chief one is the common error that the Second Law of Thermodynamics forbids local increases in order. As a corrective, one might refer to Robert Wright's "non-zero-sum" model of evolution, which gives a persuasive explanation for why history must be, in some sense, both progressive and teleological. Actually, the idea that evolution may be a process by which "ideal forms" incarnate is not so far off the scientific reservation, according to Simon Conway Morris. However, even a Platonic approach to evolution requires that higher forms appear with the passage of time. Be this as it may, the point Tradition tries to make is that religious novelty is never for the better. This has proven to be the case with the New Age. There is such a thing as a New Age agenda, one with a long pedigree. New Agers suppose that belief in anything beyond the psychic is patriarchic oppression. The major New Age writers usually envisage the end of Christianity, and particularly of the Catholic Church. Upton gives us a selective tour of some of the fashionable New Age belief systems of the past three decades. James Redfield's Celestine Prophecies gets a rather more thorough critique than the matter merits. (Upton does hit the nail on the head by calling the cult of the books a manifestation of "New Age singles culture.") Deepak Chopra comes in for measured criticism for seeming to equate enlightenment with material well-being. Some of these writers have always been obscure and have become only more so with the passage of time. Still, their ideas have permanently affected the popular imagination. Upton believes that "A Course in Miracles" is the acme of New Age thought. It is based on the channeling of the "Seth Material" by Jane Roberts. As you might expect, this is a lengthy revelation that is supposed to come from a supernatural entity named Seth. The resulting doctrine does, at least, accept the existence of a divine absolute. The problem is that the absolute is so absolute that God does not even know this world exists. "A Course in Miracles" purports to go beyond the dichotomy of transcendence and immanence by saying that this ego-generated world is too unreal for God to be immanent in. I was previously unfamiliar with "A Course in Miracles." It seems to be almost classically Gnostic, complete with a dying and senescent demiurge in the form of the Christian God. Remarkably, "A Course in Miracles" adapts the Many Worlds interpretation of quantum mechanics as the basis of a theory of simultaneous incarnation. That is unlikely to be true, but it is very ingenious. Upton is so impressed by the Seth material that he wonders whether it may have been designed to lead astray the metaphysically inclined. He has particularly harsh words for its treatment of the question of whether God is personal: "The tendency to use the Impersonal Absolute to deny the Personal God, all-too-common among many people shallowly interested in mysticism and metaphysics, is simply another form of the ego's desire to be God." Depersonalizing God distorts the divine essence into a mere cosmic potentiality. We may use it, but it can make no demands on us. In Christianity, Upton points out, the meaning of the incarnation of the Second Person is that no one may approach the Godhead except through personality. There is a larger metaphysical point here that is worth a little attention: the distinction between transcendence and abstraction. An abstract idea is merely a selection of common features. Upton's notion of a transcendent idea, in contrast, sounds like a "phase space." It encompasses all that something can be. Archetypal ideas are ideas of this order. In Upton's system, an entity of this sort is just what we mean by a "person." God is more than personal, but he is also personal in this way. If great archetypal ideas are personal, it by no means follows that they are necessarily friendly. The powers of darkness appear as unconscious belief systems and social mores. An unconscious false belief on the psychological level is a demon at the psychic or spiritual level. The world is misled by fallen entities of a high order: cherubim, demons of the Intellect rather than of the will. In Upton's estimation, these shadows of the Four about the Throne can be characterized as Law, Fate, Chaos, and Self. These false alternatives war among themselves, and foment war on Earth. Self-deluded, they delude us. "Friedrich Nietzsche said, 'Be careful: while you are looking into the abyss, the abyss is looking into you.' This is why I caution the reader not to open this section while in a state of depression, anxiety, or morbid curiosity. Whoever already knows how bad UFOs are, and is not required by his or her duties to investigate them, should skip this chapter." Despite the warning, Upton's account of extraterrestrials as a postmodern demonology is not without a certain morbid fascination. The growth of the popular cult of UFOs means that the blackest kind of black magic has gone mainstream; an assessment that, oddly enough, echoes Michael Barkun's conclusion that the UFO mythology have served to distribute "stigmatized knowledge" throughout the whole culture. Upton relies heavily on the UFO researcher Jacque Vallee, who is best-known for arguing that the reports of UFO encounters closely resemble folkloric accounts of meetings with faeries, incubi, and (Upton's favorite spooks) jinn. Vallee does not limit the phenomenon to folklore. In the more than fifty years of UFO reports, there are real physical effects, instances of mass psychological phenomena, and human manipulation. About this Upton says: "The critical mind tries to make sense of this, fails, and then shuts down. It is meant to." Upton sketches a history for us. The earliest accounts of meetings with extraterrestrials, which date from the mid-20th century, come from people with connections to the occult underground. Black magicians, who earlier in the Occult Revival had been able to invoke demons only for themselves, had been searching since the beginning of the century to invoke them for the masses. This was not entirely the magicians' idea. The Jinn, or at least the malicious ones, are seeking a stable incarnation in this world. They induce people to welcome and worship them. They also, perhaps, inspire computer technology and genetic engineering. These technologies undermine the human image. They also could be media through which the jinn achieve bodily form. They would then either displace the human race, or corrupt it to their purposes. "The characteristic 'religion' of some (but not all) sectors of this global elite is a kind of 'world fusion spirituality' – which, however, is essentially psychic, not spiritual – made up of texts, music, ritual objects, yogic and magical practices, and even shamanic initiations from around the world." The spiritual disorders that arise from the denial of the personal God are important precisely because they are integral to the drive toward world unification. Neither side of the globalization struggle is strictly on the side of the Antichrist, but then neither is necessarily opposed to him. Postmodernism is one of the reasons what a united world would be intolerable. Upton correctly notes that pluralism and the subjectivity on which postmodernism is based are incompatible. Postmodernist globalism, under the cover of multiculturalism, creates unity by denying its possibility. Metaphysical unity is a reality, always and everywhere. When it is denied, it reasserts itself as power rather than as cognizance. On the other hand, the multiplicity of cultures is metaphysically necessary, because each reflects some aspect of the divine. Suppress that multiplicity, and the result will be inter-ethnic chaos, which only force can control. As is so often the case in this book, one notes that Tradition comes in different forms, and that all of them use the cultural resources of historical societies in a selective fashion. Other writers influenced by Tradition emphasize the archetype of the "empire," of the necessary unity of humanity, which is found in many civilizations. Even Islam, which makes a point of officially tolerating the existence of other confessions, contemplates that this toleration should occur in the context of a universal Caliphate. Upton's critique echoes the common anti-globalist complaint that both the unity and the diversity offered by globalization are disingenuous. In any case, Upton asserts that today we live in a world that has moved from "the revolt of the masses" (which old-style conservatives like Guenon worried about) to "revolt of the elites" (which troubled another of Upton's favorites, Christopher Lasch). For the first time in history, it is the wealthy and educated who want to remake the world. As a critique of globalization, The System of Antichrist is in many ways a more lucid version of Hardt & Negri's "Empire." (That book, despite it postmodern Marxist rhetoric, expresses many Traditional themes.) Actually, for a book that is supposed to reflect the viewpoint of primordial truth, Upton's seems to accept uncritically the "litany" of the anarchist left, from alleged environmental collapse to corporate malfeasance. Fundamentally, however, politics and economics are epiphenomenal to what is really happening. The Antichrist appeals to the best in us; therefore he is at his worst when he most closely approximates the truth. Beyond the vulgar New Age, we learn, there is a long-running tradition of "counter-initiation." The people engaged in this project do not seek to destroy the revealed religions, but to subvert them in all their forms, exoteric and esoteric. The Theosophical Society is the best–known example, but Upton is most alarmed by those he calls the "false traditionalists." Most famous of these is Carl Gustav Jung, who is a well known inspiration for the world's proto-global elites. The object of Upton's peculiar ire, however, is one William W. Quinn, Jr., author of The Only Tradition. While sometimes deploring the dissolution of traditional cultures and religions, Quinn sees it as a necessary step toward the creation of a Traditional Planetary Culture, one that will be simultaneously scientific and religious, a post-democratic world ruled by a hierarchy of adepts. This is very much what the system of Antichrist would look like in its maturity. Upton admits he was strongly tempted by the prospect of a Traditional Planetary Culture, but overcame the glamour. False Tradition of this kind is a mere "higher empiricism." It views revelation, not as the word of God, but only as data. The result is metaphysics without religion; in other words, a sort of psychic engineering. Again, God becomes a resource, not a person. As for the apocalypse itself, we are given a comparative tour of mythologies as they relate to the endtime. (I once attempted such a study myself, by the way, in a book called "The Perennial Apocalypse.") Upton's survey includes aspects of the eschatological ideas found in Zoroastrianism, Buddhism, Christianity (chiefly in its Orthodox version), Islam, and the religions of the Hopi and the Lakota. As you might expect, the survey finds a high incidence of Antichrist-like figures who deceive the world in the latter days, and Messianic figures who briefly restore Tradition before the end. We learn quite a lot about the Shiite idea of the "occultation": messianic figures disappear for centuries, until they are ready to play their endtime role. Despite the high incidence of millenarian hopes throughout history, we are given to understand that a literal Millennium, of a perfected earthly society, is not Traditional. However, Upton intriguingly parses the possibility of a "short Millennium." This might be consistent with the reign of the Mahdi, or the period alluded to in Revelation that occurs immediately after the Second Coming. This period is variously described as lasting a few days, or months, or years; in one Shiite version, it lasts 309 years. Our destiny is the New Jerusalem, the perfection and crystallization of our world. Though Upton is no more clear than his sources, one gathers that will occur Elsewhere. There may be some continuity of our physical world with a following one. It is possible that Earth will not be destroyed, and even that there may be a few human survivors. That next world, however, will be another creation. Our business is with salvation in this one. Upton suggests some spiritual possibilities unique to the endtime. The latter days allow for detachment, since at last we know enough not to place our hopes in history or "the future." There is also a unique opportunity to acquire encyclopedic spiritual knowledge from around the world. Indeed, the very advent of the Traditionalist school is a providential "sign of the times." Finally, we may hope for the spread of serenity like that which accompanies the old age of just persons, through whom eternity begins to shine. On a practical level, we must not forget that the forces of globalization and those opposed to it are equally apt to the hand of Antichrist. He might even come to power to overthrow a previously established world system. The System of Antichrist suggests that we deal with this situation in the way that Jesus did when he was asked whether it was licit to pay taxes to the Romans. To that he answered that we should render to Caesar the things that are Caesar's, and to God the things that are God's. We must avoid being trapped in crooked choices. Our goal in the latter days is not to save our lives, but our souls. Even politics can be a "liturgy," in which we play the role we are assigned. Upton's analysis merits comment. So does the doctrine of Tradition itself. No doubt it is true that God forgives even theologians for their theology. Nonetheless, the principle of the transcendental unity of religions is open to question. The doctrine holds that the revealed religions are more similar to the degree that they approach their Object. This is not obviously so. Regarding personal eschatology, for instance, the Buddhist "moksa" is not equivalent to the Christian Beatific Vision; neither is self-evidently identical to the model of collective immortality that Upton himself seems to favor. The latter's best known exponent is the Muslim mystic Ibn al-Arabi. That is an important point. In addition to Western Hermeticism, Tradition exhibits quite a lot of Sufism. The primordial Traditionalist, Rene Guenon, famously became a Muslim, and Upton followed suit. There are Christians, indeed Latin Christians, who consider themselves Traditionalists. Still, sometimes I can't help but wonder whether Tradition is just a very refined form of Sufism. This suspicion is probably misplaced, but Tradition is nonetheless parochial in a more fundamental way. Sufism is a wisdom that crystallized from an age of skepticism and heresy. So, for the most part, are the other civilized esoteric traditions from which Tradition was composed. Tradition is not primordial. It's like the music of Solesmes, which was created at almost the same time as Tradition, and for much the same reasons. The Traditionalists are right, surely, when they say that it is mere bigotry to look on the past as inferior simply because it is past. We have a duty to extend the same sort of imaginative sympathy to the modern era that we do to distant times and places. The West is still going through its own centuries of skepticism. Someday, modernity could appear as primordial as Atlantis. The problem is not that the US exports fear. It's that the US has so far failed to rouse the thanatophilic international class from what may be a terminal coma. It turned out that the international class became extremely enthusiastic about the War on Terror, and was willing to open new fronts worldwide. In part, this is because you could marry the transnational [John's term] or globalist [current term] agenda to exporting war under the rubric of human rights and free trade. It probably also helped that President Obama was a leader more to their tastes, although the Bush family business interests align them pretty strongly to globalism as well. Also, John thought that Michael Moore's style of popular political documentary would flop. It turned to be quite successful, and widely imitated. No doubt the police stations will blow up eventually, but now the explosions will not be part of a war of independence, but of an insurgency against a popular government. As I have remarked before, few images could have overcome the visual impact of the Abu Ghraib pictures, but Zarqawi seems to have done the trick with his televised beheadings and infomercials in which hostages plead for their lives. For the last generation in Iraq, political authority was gained by horrifying the opposition into submission. With a plausible alternative to hand, it is possible, even likely, that the tactic will fail this time, but that is by no means certain. Bush Administration Calls an End to the "War on Terrorism." No, I haven't taken leave of my senses on the way out the door. I realize that we have enemies and they need to be confronted. But I do not want this to be all that America is about in the world anymore, and that is what has happened under this administration. I don't want the rest of my career to be about an America that exports fear, not hope, and ends up importing everyone else's fears as a result. I don't want it to be about explaining to young Chinese why my government can't give them student visas anymore. I don't want it to be about visiting U.S. Embassies around the world and finding them so isolated behind barbed wire, they might as well not be there at all. Defeating "them" has begun to define "us" in too many ways. The signal illusion from which America has to awake in Iraq and everywhere else is that it serves God's providence or (for those with more secular beliefs) that it is the engine of history. In Iraq, America is not the maker of history but its plaything. In the region at large, America is not the hegemon but the hesitant shaper of forces it barely understands. Do you think? War and statecraft are always improvised. We work with imperfect information, and at least some results are always unexpected. Frankly, compared to occupied Japan and the trainwreck-that-was-Europe between 1945 and 1948, US reconstruction efforts in Iraq have been made with singular dispatch and success. 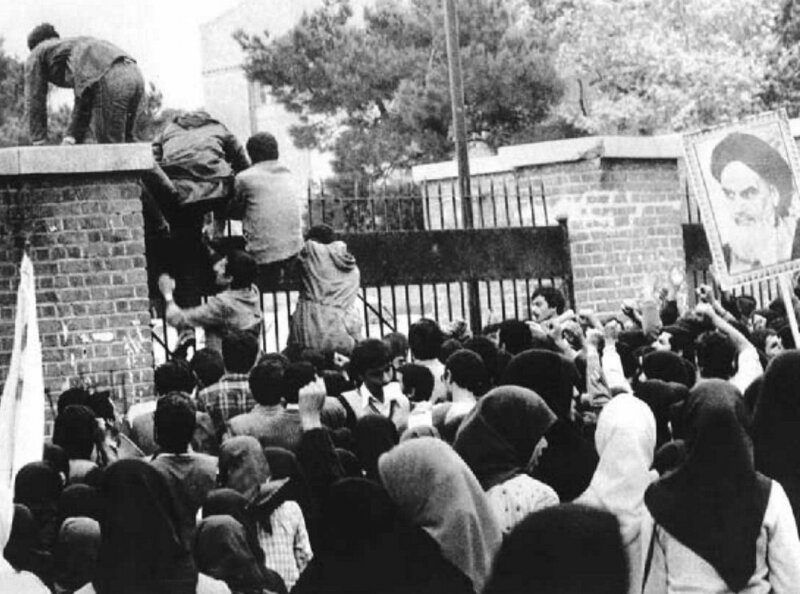 The big difference from World War II is that the overthrow of the Baathist government was not the end of the Terror War, but only the beginning of a new phase. The Bush Administration never said otherwise. For Ignatieff, the null hypothesis was American omnipotence; he experienced the shortfall from that standard as failure. In reality, if America were omnipotent, it would not need a defense policy at all. The fact is, though, the United States is vulnerable. Sometimes it has to act, even when success is uncertain, even when imperfectly prepared. As for the role of the US in history, it certainly is not the case that history is an American artifact. The US does have a special place in the world system, and that, I think, is real reason for the disaffection of the transnationalists. Catholic bishops recently met and sought the best way to enforce "church teaching" with Catholic politicians who fail to oppose laws that allow abortion. Some critics of the bishops see this as a violation of the separation of church and state. Both sides are working from misconceptions. Abortion is not a church issue, so what the bishops have to say about it cannot be an intrusion of the church into state concerns. Abortion is, admittedly, a moral issue -- but not one that can be settled by theology or by religious authority. One might argue that the natural-law arguments against abortion are unpersuasive. (Willis account of the scriptural arguments is unpersuasive, in the sense he does not state key evidence contrary to his position, but there's Willis for you.) Nonetheless, the prohibition of abortion is part of the Magisterium. That is the Catholic position. You really don't get to make this stuff up. Michael Moore's "Fahrenheit 9/11" took in a whopping $21.8 million in its first three days, becoming the first documentary ever to debut as Hollywood's top weekend film. First, very soon we will see, not just bootlegged copies of the film, but versions in which the sound track has been modified to better reflect the political views of the bootlegger. Second, real producers will now start to greenlight activist political documentaries. All of them will flop. Thanks to a South Asian history professor I had, I always hear the word 'hegemony' with an British accent in my head. I also remember dropping my coffee into my favorite hat in that class, but the TA was teaching that day. Unlike a lot of John's post-9/11 writing about the intersection of war, terrorism, the Middle East, and American domestic politics, I find this blog post interesting. At this point, I find a lot of the things John said in 2003 and 2004 embarrassing, but I try to stick to the program of reposting everything because I believed those things too, at the time. I also think John was a better man than his advocacy of the Iraq War might imply. But we have to face what we have said, and what we have thought; what we have done, and what we failed to do. John first references a very old essay of his, Permanent Interests, written in 1996. After twenty years, I think that essay has aged pretty well. Especially as politics in the Western world has started to pivot to the globalism/nationalism axis instead of the Left/Right axis, it is good to remember that the current state of international politics is a creation of the United States of America. The UN Security Council represents the coalition that won the Second World War, and things like the World Trade Organization represent the later United States that had won the Cold War too. John goes on to suggest there is a kind of historical inevitability to this, insofar as the peculiar madness the Soviet Union represented may not have been the primary factor resulting in the world we see today. I am not entirely convinced, but this kind of argument relies on counterfactuals, and is hard to make. Despite Gordan Chang still being wrong, I remain more sympathetic to the idea that China may not fully realize the potential of its vast population and surging economy in the coming decades. One of the greatest points in favor of the metahistorical theories of Spengler and Toynbee and their ilk is that is makes it easier to understand why Europe happened to eclipse the older and more advanced Chinese and Ottoman Empires; they were just in different phases of their civilizations, and it is hard to overcome the inertia built up over nearly a thousand years. Of course, this theory may be wrong, so I would like to wait and see what happens. John's more narrow point about the trajectory of American politics seems to have been largely borne out by subsequent events. The foreign policy of President Barack Obama, or the likely foreign policy of Hillary Clinton, bear a strong family resemblance to the foreign policy of the hated George W. Bush, minus the American casualties, plus a strong dose of drones and special forces. In the bitter aftermath of the Arab Spring, we can see the fruit of this idea, now enacted by both Right and Left in America. Socialism in the sense of caring deeply for your citizens, has been effectively buried by Hillary Clinton [in the form of Bernie Sanders]; instead she represents the international community precisely as John defined it in 1996. The twist that John missed is that the identity politics of the Left have been used as a cover for the economic politics of the Right. The economic inequality of the robber barons has been successfully fused with the most radical individualism of the flower children. In my opinion, this is the culmination of long-standing American policy. For example, consider the allegation that the CIA funded modern art as a tactic in the Cold War. Even now, Americans on the right often consider modern art a sign of decadence and decline. Yet, for all that, modern art is as expensive as ever. The reason is that rich capitalists keep buying it. Finally, we may note one other way in which the state of the world has not changed with the end of the Cold War. The Left in the U.S. throughout that period saw its role as more or less the defense of socialism. Thus, they sought to limit the influence and power of the United States. Even with no more Fatherland of Socialism to defend, they still continue the same policy, like a missile defense system that keeps working even after the civilization that built it has died out. When they finally realize that anything they want to achieve in the world will have to be achieved through the United States, we will have a different politics. [However, entire] populations around the world feel a personal dislike for America's president, which makes it difficult for even the friendliest of political leaders in some countries to take pro-American positions. I hate, I hate that woman. I hate everything about her. I hate the way she licks stamps. There is something to be said for this assessment, as well as for the historical analogies that Berman's prescription conjures up. It's often the case that the opposition implements the policies of its discredited predecessor. FDR's economic policies were different in degree rather than kind from Herbert Hoover's. Poor, damned Richard Nixon spent his years in office enacting the wishlist of the progressive Democrats. So why might John Kerry not complete what George W. Bush has begun? For one thing, the foreign policy wing of the Democratic Party is the American avatar of progressive transnationalism. Today, at least, Tranzie World is a morbid, unhelpful phenomenon. It's the European malady writ large. There is actually something of a bait-and-switch in the Berman article. There really are "liberal democrats" in the Muslim world. There are, however, few if any "liberal democrats" in the domestic American sense. This can never be repeated often enough: if "liberal democracy" means things like defining marriage out of existence, then the world will reject it. The Culture War is a national security issue, and the Democrats are on the wrong side. Then there is personality. George Bush is not Lyndon Johnson. I suspect that John Kerry may well be. There are three interesting points about Osama bin Laden's recent offer of a truce to Europe. The first is that the text makes a conditional offer at all. Usually, his messages are along the lines of "This is why I am killing you." It's something of a novelty for him to ask his enemies to do anything but die. The second point is that he apparently follows the anti-war literature. The military supplier, Halliburton, has become one of the objects of his especial ire. It's hard to believe that this condemnation has anything to do with events on the ground. He is reaching out to Western opponents of the war (as the hapless Moqtada al-Sadr has attempted to do, too, now that I think of it). Finally, and most important for the people muttering about exit strategies, he links the US and the UN in a way that leaves no room for compromise with either. He is onto something if he thinks that the UN does not mean much without the US in the context of an actual war. It's a pity that the UN's advocates have never taken this on board. This is not to say that the UN does no good. Its agencies, often older international bodies that the UN has absorbed, continue to carry on the unseen maintenance functions on which civilization depends. The International Telecommunications Union, for instance, has recently seen fit to update Morse Code. Hereafter, the "@" symbol found in email addresses is supposed to be rendered as "dit-dah-dah-dit-dah-dit." Many of the hobbyists who use the code will continue to just write "at," of course, but I for one am pleased to see that anyone is still using Morse at all. Before the 20th Century, private armies were as common as government-backed militaries; maybe more so. The ancient Egyptians, Greeks, and Romans all used arrows-for-hire. "Contract armies fighting contract armies, led by contract generals," is how Singer describes the Thirty Years War (1618-1648). This all has a fine Spenglerian ring; Spengler was predicting the end of mass, national armies even as the build-up to World War II started. However, this does not seem to be what is happening in Iraq. There are no armies of mercenaries there conducting large-scale operations. In a situation where the state does not exist, a few rent-a-cops are not enough; hence the rent-a-paratrooper. Headlines like this are multiplying: Newest Export Out of China: Inflation Fears. Domestic inflation in the US also seems to be reviving; at least it is no longer negligible. This is important for a number of reasons, but among the most important is that it makes the Bush Republican Party obsolete. Whatever its other elements, the glue that held his coalition together was the promise of lower taxes. It was possible to deliver on that platform, so long as the fiscal deficit was costless. However, we are now moving to a situation like the 1970s, when people will associate deficits with ever-rising prices. It will be possible to portray tax cuts as a form of theft: government by inflationary expropriation. Again, there is no safe alternative to reelecting George W. Bush in 2004. That is necessary for the successful prosecution of the Terror War. Then, however, it will be necessary to change partners. For the longer term, there has to be a coalition of fiscal conservatives, military realists, and sober Culture Warriors. All these were features, oddly enough, of the New Deal. The trend is away from libertarianism, and toward public order, which will have to be seen to encompass features like a national health system. The existing political parties may have to dissolve to provide components for the mix. Finally, thanks again to those of you who have been using the Amazon search buttons. The commissions are nice, but I appreciate the thought more.